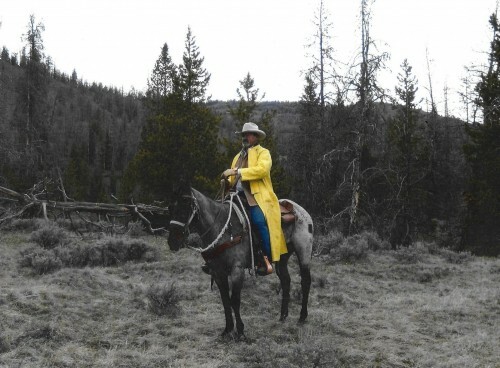 2005 AQHA bay roan gelding.He is mostly blue roan,and a dark bay in the winter, 15:1 HH, 1100 lbs. I have owned him 5 years, have never known him to buck. Moves off your leg to turn or side pass. I have ridden him in the mountains on pack trips and have also packed him. Trained on picket rope or hobbles. Nice neck rein and stop, nice rocking chair canter, fast walk. Easy to catch, shoe, and load. Previous owner used him as a heading horse two years, a pick-up horse, and roped calves at branding. When I bought him he was the champion heading horse at the 2012 Jake Clark sale in Cody. I don’t rope because I have a bad arm but there is no reason he could not go back to roping. I am 67 and retiring from horses, otherwise would not sell him.